Relationships Australia South Australia Health Promotion Service has launched a new website as a part of the Statewide CALD DV Service implementation. 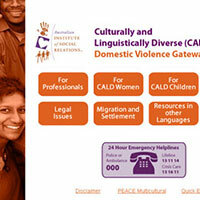 The Statewide CALD DV Service forms part of a comprehensive reform process relating to domestic violence in South Australia. This website is designed to link homelessness and DV service providers with complimentary services and resources. The website includes a link to training calendars that detail FREE training and professional development events relevant to the Domestic Violence and homelessness sectors being run in 2012. Relationships Australia South Australia Health Promotion Services is subcontracted by the Migrant Women’s Support Service to deliver workforce development as part of the Statewide CALD Domestic Violence Gateway Service, funded by the South Australian Government, Department for Families and Communities through the National Affordable Housing Agreement and National Partnership Agreement on Homelessness.